..and once you're done respecting him, go ahead and show Boba Fett some love too. Get ready to feel the respect. Jango was pretty strong, one of the reasons he was selected as the prime candidate for the Clone Army to copy their genes from. Kicks a durasteel door off it's foundations. Capable of picking up and flying around with a young Boba. One shots multiple Jedi with his bare hands. As for speed, he also isn't lacking. Dodges blaster bolts, leaps over a flamethrower burst into an acrobatic kick and creates an after-image with a knife slash. Jango dodges a blaster bolt. "Another blaster shot followed, then another, and the Jedi easily picked them both off, deflecting one and turning the other back at Jango. But as the bolt ricocheted toward him, the bounty hunter leapt away, his rocket pack flaring to life, sending him up to the top of the nearby tower." "Jango's hands worked almost imperceptibly, twisting in and about the Jedi's arms and hands, expertly loosening Obi-Wan's grip." Jango's skills as a tactician and overall combatant are among the best in the galaxy. "After the murder of his parents, Jango Fett was adopted and raised by the legendary Mandalorian warrior army, a mercenary group who earned a reputation as the most formidable supercommandoes in the galaxy. The Jedi destroyed this dangerous force, but Fett survived and continues to wear the armored, weapon-filled uniform that helped make the Mandalroians a dreaded name. Keeping himself in top condition and training often with his equipment, Jango Fett combines physical and tactical skill with a prudent intelligence that is a rare attribute in the bounty-hunting community." "Never governed by passions or panic, Fett coolly calculates his every move, always playing to win or survive. He knows when to make use of evasion and thus outlasts both rivals and opponents." 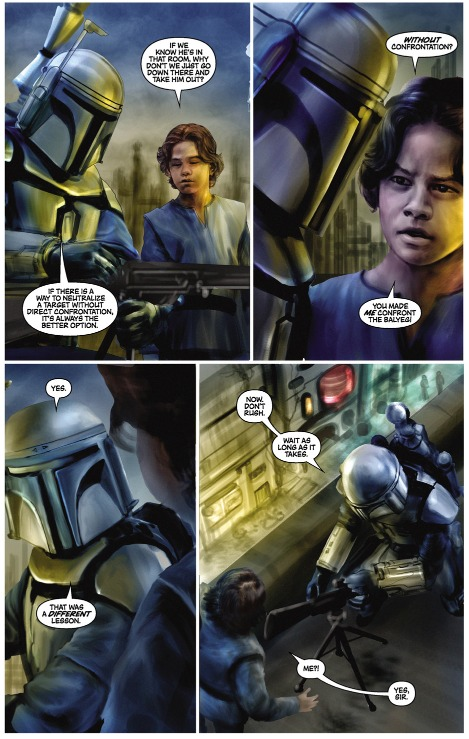 Jango at a young age earned the favour of his fellow Mandalorians, and succeeded his mentor, Jaster, as Mandalore. "Over time, Jango rose through the ranks. When Jaster Mereel was killed in battle, Jango was named the commander, the youngest in the long history of the notorious mercenary army." "Since ancient times, Mandalorians have been brutally effective fighters, and especially so under Jango Fett's leadership." Mandalorians are among the most elite fighting forces in history. He was handpicked by Count Dooku to be the Clone Army's gene-source. "He's the perfect soldier in every way." Jango was capable of outsmarting Dooku in order to gain some leverage over him, by poisoning him. Granted, Dooku used the Force to heal himself later, but Jango could have killed him then and there. Jango teaches Boba an important lesson about when to avoid direct confrontation. Jango was the best Bounty Hunter in the galaxy, and because of this, he often gets challengers trying to make a reputation for themselves. Not a good move. Jango shows CQC skill while dispatching a Death Watch Mandalorian. Jango was capable of killing numerous Jedi armed with nothing more than a rock, some snow and his training. Gives Obi-Wan Kenobi a solid fight. "As Jango swung about, Boba's eyes went wider still. The running figure was their Jedi visitor-and he was drawing his lightsaber and igniting a blue blade that hissed in the downpour. "Get on board!" Jango called to him, but Boba hesitated, watching his father pull out his blaster and fire off a bolt at the charging Jedi. With amazing reflexes, Obi-Wan snapped his lightsaber about, deflecting the bolt harmlessly wide. "Boba!" Jango yelled, and the boy came out of his trance and scrambled up the ramp and into Slave I.
Obi-Wan launched himself through the air at the bounty hunter. Another blaster shot followed, then another, and the Jedi easily picked them both off, deflecting one and turning the other back at Jango. But as the bolt ricocheted toward him, the bounty hunter leapt away, his rocket pack flaring to life, sending him up to the top of the nearby tower. Obi-Wan tumbled headlong, turning while he rolled to come around as Jango fired again. Without even thinking of the movement, letting the Force guide his hand, the Jedi brought his lightsaber to the left and down, knocking the energy bolt aside. "You're coming with me, Jango," he called. The man answered with a series of shots, a line of bolts coming at the Jedi. The lightsaber went alternately left then right, picking off each one, and when Jango altered the pattern, left, right, left, right, then right again, the Force guided Obi-Wan's hand true. "Jango!" he started to call out. But then he realized that the bounty hunter's latest shot was not a bolt but an explosive pack, and the next moment he was diving, enhancing his leap with the Force. All of Slave I recoiled from the explosion outside, and the jolt sent Boba tumbling to the side. "Dad!" he cried. He scrambled to the viewscreen, flicking it on and orienting the cam on the scene below. He saw his father immediately, and burst out in tears of relief. He calmed himself quickly, though, scanning the area for the enemy Jedi, and saw Obi-Wan coming over from a roll, back to his feet-and blocking another series of bolts with seeming ease. Boba scanned the panel, trying to remember all his lessons about Slave I, glad that he had been so diligent in his studies. With a wicked grin that would have made his father proud, Boba fired up the energy packs and clicked off the locking mechanism of the main laser. "Block this, Jedi," he whispered. He took a bead on Obi-Wan and pulled the trigger. "You have a lot to answer!" Obi-Wan called to Jango, his voice sounding thin in the thunderous downpour and lashing wind. "It'll go easier on you, and on your son, if-"
He stopped suddenly, registering the report of a heavy laser somewhere in his subconscious. The Force had him moving instinctively before he even understood what was happening, leaping and flying across the air in a double somersault. He landed to find the ground shaking violently under his feet, quaking from the thunder of Slave I 's heavy laser cannon, which swung around to follow him. Obi-Wan had to dive again, but this time the bouncing report sent him sprawling to the ground, his lightsaber skidding from his grasp across the rain-slickened surface. Fortunately, Slave I 's cannon went quiet, the energy pack depleted for the moment, and Obi-Wan wasted no time leaping to his feet and charging at Jango Fett, who was coming hard his way. A blaster bolt led the bounty hunter in, but Obi-Wan leapt above the streaking line of energy, flying forward and spinning around to snap-kick the weapon from Jango's hand. The bounty hunter didn't flinch. He charged right into the Jedi as Obi-Wan landed, looping his arms over Obi-Wan's and bearing him backward. He tried to wrestle Obi-Wan to the ground, but the Jedi's feet were too quick for that, setting him in perfect balance almost immediately. He slid one leg between the bounty hunter's feet and started to twist to the side, weakening Jango's hold on his arms. Jango smiled wickedly and snapped his forehead into Obi-Wan's face, dazing him for a moment. The bounty hunter pulled a hand free and launched a heavy punch, but realized his mistake immediately as the Jedi ducked the blow and did a tight, stationary somersault right under the swinging arm, double-kicking out as he came over, his feet slamming Jango in the chest and throwing him backward. Now Obi-Wan had gained the initiative and he used it with a fierce charge, slamming into the stumbling bounty hunter, thinking to bring him down to the ground beneath him, where the encumbering armor the man wore would work against him. But Jango showed the Jedi why he had been chosen as the basis for the clones. He went with the flow of the tackle for a moment, then suddenly reversed his footing and his momentum, stopping Obi-Wan's progress cold. Jango launched a left hook. Obi-Wan ducked and snapped out a straight right in response. Jango slipped his head to the side so that the blow barely grazed him. A short rocket burst had him in the air and spinning a circle kick out at Obi-Wan, who dropped to his knees and ducked it, then came up high in a leap, over the second kick as Jango came around again. Now Obi-Wan snapped off a kick of his own, but Jango accepted the blow against his lowered hip and snapped his left arm down across the Jedi's shin, locking the leg long enough for him to drive a right cross into Obi-Wan's inner thigh. The Jedi threw his head and torso back, lying flat out and lifting his left leg as he did, kicking Jango under the side of his ribs. A sudden scissor-twist, right leg going down and across, left leg shooting across the other way above it, had Jango and Obi-Wan spinning sidelong. Obi-Wan caught himself with extended arms as he turned facedown, broke his feet from their hold on Jango, and mule-kicked the falling man backward. Then, going down to the platform to launch himself right back up to his feet, he turned about and rushed forward, gaining an advantage on the off-balance and struggling Jango. A right cross smashed the bounty hunter across the face, followed by a looping left hook that should have laid the man low. But again, with brilliant reflexes, Jango ducked the brunt of that blow and caught the surprised Obi-Wan with a sudden and short, but heavy, left and right in the gut. The Jedi's right hand waved across between his face and Jango's, and he used a quick Force shove to throw the man back a step until he could straighten and find a defensive posture once more. Jango came right back in, fiercely, wildly, kicking and punching with abandon. Obi-Wan's hands worked vertically before him, hardly moving, amazingly precise, turning blow after blow harmlessly aside. He turned one hand in and down suddenly, taking the momentum from a heavy kick, then came right back up to lift Jango's jabbing fist up high. Then he snapped his hand straight out, his stiffened fingers smashing against a seam in the bounty hunter's armor. Jango winced and fell back. Obi-Wan launched himself forward, diving onto the man, going for the victory. But Jango had an answer, firing his rockets and lifting both himself and the grappling Jedi up into the air. A burst of a side-thruster sent the pair out past the landing pad proper to the sloping skirt of the structure. Jango's hands worked almost imperceptibly, twisting in and about the Jedi's arms and hands, expertly loosening Obi-Wan's grip. Then he fired his thrusters, left and right, causing a sudden and repeated jerk that broke him free of Obi-Wan's grasp. Obi-Wan hit the deck hard and slid perilously close to the edge-close enough to hear the great waves breaking against the platform's stilts below him. He caught a hold and reached into the Force, using it to grab his lightsaber, recognizing that he was suddenly vulnerable. He heard a shot from the side, not the screech of a blaster bolt, but a pfizzt sound, and rolled as far as he could. But not far enough. He lost his concentration, along with his grasp on his lightsaber, as a thin wire slid under his wrists, then wrapped about them, securing him tightly. And then he was sliding, back up the sloping skirt and across the platform, towed by the rocket-man. With reflexes honed by years of intensive training, and with the Force-strength of a Jedi Master, Obi-Wan snap-rolled his body forward, back up over his outstretched arms, tumbling to his feet, then leaping out to the side as the towline again went taut, jerking him along. He rolled about a pylon and came back to his feet again, now having the leverage of the metal pole helping to hold him there. Reaching deeply in the Force once more, he grounded himself, becoming, for an instant, almost as one with the platform. The wire snapped tightly, but Obi-Wan didn't budge. He felt the angle of the pull change dramatically as the rocket-man plunged to the deck, his pack breaking away. Obi-Wan started around the pole, but stopped and shielded his eyes as Jango Fett's rocket pack exploded with a burst of light and a tremendous concussion. "Dad!" Boba Fett cried as the rocket pack blew apart, his face coming right to the viewscreen. But then he saw Jango, off to the side and apparently unharmed, though tugging frantically against the pull of the wire-that was now being controlled by the Jedi. Boba slapped one hand helplessly against the screen, mouthing "Dad" again, and then he winced as the Jedi slammed into his father, kicking and butting him, and both of them, locked together, went rolling off the back edge of the landing pad, sliding fast down the skirt and toward the raging ocean. Obi-Wan kicked and tried to find his way back to the Force, but Jango punched him repeatedly. He could hardly believe that the bounty hunter would waste the effort, with certain death awaiting them both at the end of the slide and fall. He managed to pull back somewhat and saw Jango lift one forearm, a strange smile on his face. The bounty hunter clenched his fist, and a line of claws popped forth from the armor. Obi-Wan instinctively recoiled as Jango lifted that arm higher, but then the bounty hunter slammed it down, not on Obi-Wan, but on the platform skirt. At the same time, Jango worked his other hand, releasing the locking mechanism of the wire-launching bracelet, and it slid free of his arm. He screeched to a halt, and Obi-Wan slid past him. "Catch a roller fish for me," the Jedi heard Jango say, and then he was falling, over the lip and down toward the raging whitecaps."Dad! Oh, Dad!" Boba Fett cried in relief as he spotted his father clambering back over the skirt lip and onto the platform. Jango climbed to his feet and stumbled toward Slave I, and Boba rushed to the hatch, sliding it open and reaching down to help his father aboard. "Get us out of here," the dazed and battered Jango said, and Boba grinned and rushed to the control panel, firing up the engines. "I'll put her right to lightspeed!" "Just break atmosphere and take her straight out!" Jango ordered, and his words came out with a growl of pain as he held his bruised side. Then he noticed his son's wounded look. "Get the nav computer on line and have it set the coordinates for the jump," he conceded. Boba's smile beamed brighter than ever. "Liftoff." he shouted.Obi-Wan used the Force to grab the trailing, loose end of the wire that still held him by the wrists, and he threw that end out, looping it over a crossbeam in the platform structure. His descent stopped with a sudden jerk. He glanced around, then began to swing, back and forth, gaining momentum until he was far enough out to pull himself free of the bond and drop lightly onto a small service platform, barely above the lashing waves. He took only a moment to catch his breath, and then opened the door of the service turbolift with a wave of his hand. Even before the door opened at the landing platform, he heard the engines of the bounty hunter's ship roar to life. He came over the lip, spotting his lightsaber immediately and calling it in to him with the Force. But he was too late. The ship was already shuddering, ready to blast away. Obi-Wan pulled a small transmitter from his belt and threw it out long and far at Slave I . The magnetic lock of the tracking device grasped on to the ship's hull just in time. Rain and steam pouring all about him, Obi-Wan Kenobi stood there for a long while until Slave I disappeared from view. He looked around at the platform, replaying the battle in his head, his respect for this bounty hunter, Jango Fett, growing considerably. He understood now why Jango had been selected by Sifo-Dyas, or Tyranus, or whoever it was that selected him. The man was good, full of tricks and full of skill. He had taken Obi-Wan Kenobi, a Jedi Knight, the man who had defeated the Sith Lord Darth Maul, to the very precipice of disaster." "Even the surprise appearance of a Jedi Knight is not enough to overcome Fett's topnotch combat skills. When Obi-Wan Kenobi tries to capture him, Jango is well-prepared and isntantly launches a volley of blasters that would annihilate an ordinary opponent." "In battle with Kenobi, Fett soon appreciates the seemingly supernatural abilities of the Jedi. Jango must quickly re-assess his tactical situation before Kenobi gains the upper hand." "Realizing that Kenobi is a formidable opponent, Fett launches his jetpack missile set for explosive charge. The missile can be optionally locked dead as a grappling hook." Shoots past the guard of Coleman Trebor, easily. Trebor had slaughtered several waves of droid battalions (which contains roughly 150 droids each) prior to this according to Insider, so he's a highly capable fighter and blaster bolt deflector. In the Attack of the Clones novelisation, Jango actually causes Mace Windu serious problems during their fight. "The reek followed Mace, and he had to slash wildly to fend it off. He did manage to drive it back, but was butted and lost his lightsaber in the process. He came up facing the reek, and figured that he could outmaneuver it to get his weapon back easily enough, but then an armored rocket-man flew down in his path, blaster leveled. Mace reached out with the Force and brought his lightsaber flying to his hand, moving like lightning to parry Jango's first shot. With the second shot, Mace was more in control, and his parry sent the bolt right back at the bounty hunter. But Jango was already in motion, diving sidelong and coming around ready to launch a series of shots the Jedi's way. He was stopped by the reek. Unable to distinguish friend from foe, the reek bore down on Jango. He scored a couple of hits, but they hardly slowed the beast, and he was tossed away. The reek charged him, trying to stomp him as he rolled about desperately. Jango was fast, though. Every time he came around, he fired again, and again, his bolts burrowing into the furious reek's belly. Finally, the huge bullish creature swayed, and Jango wisely rolled out the far side, opposite Mace, as the beast collapsed.The Jedi was on him immediately, lightsaber weaving through the air. Jango dodged and lifted into the air with his rockets, trying to keep one step ahead of that deadly blade and to occasionally fire a bolt at Mace. The man was good, Mace had to admit. Very good, and more than once the Jedi had to parry desperately to turn a bolt aside. He kept up his offensive flurry, though, keeping Jango on the defensive with sudden stabs and slashing cuts. One misstep...And then it happened, all of a sudden. Mace started to slash to the left, cut it short and stabbed straight out, then reversed his grip and sent the lightsaber slashing across, left to right. He spun a complete circuit, coming around to parry a blaster shot, but there was no shot forthcoming.That left to right reversal had cleanly landed. Jango Fett's head flew free of his shoulders and fell out of his helmet, to settle in the dirt." Mace regards Jango during his dreams..
"Jango Fett bristles with weapons. An instinctive killer: the deadliest man in the galaxy. Jango can kill me in less than a second. I know it. Even if I had never seen Kenobi's report from Kamino, I can feel the violence Jango radiates: in the Force, a pulsar of death." ..is built into the genes of any clone of Jango. This would mean that Boba Fett inherits his accuracy from Jango too - so I recommend going to my Boba Fett Respect Thread to look at his accuracy feats, since they should apply to Jango as well. Speaking of accuracy, Jango shot Zam Wesell from a fair distance away with a poison dart. This is also a feat for his sounds sensors, given how far away she was from him when she was about to give away his name. "The bounty hunter continued to glare at him, but, lips twitching, she started to answer. "It was a bounty hunter called-"
They heard a puff from above and the bounty hunter twitched and gasped, and simply expired, her human female features twisting grotesquely back into the lumpy form of her true Clawdite nature. Anakin and Obi-Wan tore their eyes away from the spectacle to look up, and heard the roar as they watched an armored rocket-man lift away into the Coruscant night, disappearing into the sky. Obi-Wan looked back to the dead creature and pulled a small item from her neck, holding it up for Anakin to see. Next, I'm going to be showing feats from the game Star Wars: Bounty Hunter. Obviously there will be gameplay mechanics involved, but canonically speaking Jango did perform these feats, so even if we don't see everything, we can still use them. Also, ignore where the player dies during missions - Jango doesn't die canonically until Attack of the Clones. Obviously. Takes down the Starship Longshot, armed with heavy laser cannons and concussion missile launchers, using only his blaster pistols. "The Longshot is an exceptionally fast starship, powered by three large Elsinore-Cordova Turbodyne engines, and it is armed with an array of autotargeting dual-barrel laser turrets and concussion missiles." "Armament: 6 rotating laser turrets (2 front; 2 rear; 2 dorsal); 1 concussion missile launcher array"
"As you enter the hangar cargo bay area, the Longshot hovers around and scans you. Meeko's turrets are targeting you! Jango spins his twin blasters and engages the craft!" "To take down this craft, target and balst away at all its turrets. Ifnore the Aqualish and Grans on the ground for the moment. You must destroy the seven turrets-two on the top of the wings, two on the front of the body, and two on the back of the main body, plus a missile turret at the craft's base." Drives off the Mandalorian Warrior Montross in single combat. Takes down a Coruscant Police Assault ship, while fighting security troops armed with blaster rifles and grenade launchers. Jango is noted as having to dodge their projectiles while shooting them. "Armament: Concussion missile launcher; two heavy laser cannon turrets"
"Around five Coruscant Police guards and an officer are stationed to protect the senator. Fortunately, they won't live long enough to be fired from their jobs -- head inside and blast them all!" "Dispatch the guards, including ones armed with a grenade launcher (shoot them while flying to avoid unpleasant and repeated blasts), then run to the window and peer out." "After you destroy the five different turrets, the craft blows apart and slowly spirals down, trailing a stream of black smoke." In Chapter 3 of the game, Jango fights through the entire guard of a maximum security prison to get to a prisoner. When he gets to the prisoner, he's already being taken by another bounty hunter (Zam Wessel), who, while escaping, incites a riot. So Jango has fight back to the surface through the riot involving the prison security and the prisoners. Just in case you want to watch all of it..
Takes down another ship.. or whatever you want to call this thing. It's armed with blaster cannons and missiles, and Jango fights prison security at the same time. Jango has to keep Zam covered as she passes through a heavily guarded canyon. He does so from a far away vantage point, with his sniper rifle, taking out ground troops and other snipers. (You need to excuse the poor accuracy of the player - that's just gameplay mechanics. Canonically, Zam makes it through the canyon without being shot, thanks to Jango's accuracy). Destroys a skiff which was being piloted by Montross, who was firing missiles at Jango throughout the fight. Out-shoots a room full of bandits and their leader, single handedly - every other mercenary sent after these bandits by Jabba the Hutt was killed, so as far as unnamed characters go, they're pretty good. Rips through Gardulla the Hutt's palace, killing all of her guards, reaching her throne. Then, after killing her, takes on a massive beast of a species I'm not familiar with, while being shot at by guards with missile launchers from all different angles. I think by this point we can deduce that Jango is very good at not getting hit by missiles! Jango finally defeats his rival, and fellow Mandalorian, Montross, in single combat. Fett gives him the luxury of a slow and painful death at the teeth of Bando Gora minions. "Montross, like Jango Fett, was once a Mandalorian Warrior, feared by his enemies, as well as by the men with whom he served. He was exceptionally brutal, even for a Mandalorian, and his reckless bravado often placed his comrades in danger." "His [Montross'] brutal, unorthodox methods suited his new profession well, and stories of his atrocities struck terror in the hearts of wanted fugitives who learned Montross was stalking them." Defeats Komari Vosa, Dark Jedi, leader of the Bando Gora cult, and former apprentice of Count Dooku, in single combat. This is especially impressive when you consider that she killed 20 Mandalorians at the Battle of Galidraan. For more information on Komari Vosa, here is part of her entry in the former StarWars.com databank, which, while replaced now, still gives us some insight on her capabilities. I've underlined the important parts. "Komari Vosa was once a promising Padawan learner, apprenticed to the legendary Jedi Master Dooku. As a student, she showed a surprisingly aggressive temperament for a member of the Jedi order, and she was especially skilled in using paired lightsabers. Vosa was with Dooku on Galidraan when the Jedi all but vanquished the Mandalorian ranks.She was personally responsible for killing 20 of the seasoned warriors. Though the Jedi would grow to regret the conflict, Dooku voiced his admiration of Vosa's abilities and predicted an eventful future for the young Padawan. Thus, it came as a betrayal that Dooku eventually denied her the chance to undergo the trials to achieve Knighthood. Dooku and others had noticed a growing infatuation in the young girl for her accomplished Master. This and other instabilities in her character prompted the Jedi Council to end her training. Enraged, Vosa fled Coruscant and joined a group of Jedi sent to rescue the people of Baltizaar from the depredations of the deadly Bando Gora cult. Many Jedi fell in that mission, and Vosa was presumed dead. In truth, she survived. Subjected to torture and cruelty, Vosa succumbed to the dark side. She lashed against her captors, defeating the leaders of the Bando Gora. Revelling in her newfound power, Vosa took command of the cult, leading it from a decrepit citadel on Kohlma, a burial moon orbiting Bogden." "Bounty hunter, assassin, and mercenary, in his day Jango Fett was one of the most feared individuals in the galaxy. After the death of his parents, Mandalorian warriors adopted, trained, and raised him, a debt he would repay when he led them during the Mandalorian Civil War. Perhaps the most important event In Jango Fett's long career was meeting Darth Tyranus. After chasing Komari Vosa, the former apprentice of Count Dooku, across the galaxy, Jango Fett finally caught up with her and killed her; this was no small feat, considering that the fallen Jedi was a skilled lightsaber duelist and a master of the Force. It turned out the entire enterprise had been a test to see if Jango Fett would be a worthy candidate to become a template for a new clone army." It's said in the Official Strategy Guide that Vosa killed at least twenty Mandalorians single-handedly, meaning she could have and likely killed more. "As a young woman, Komari Vosa was an adept Padawan learner, who frequently impressed her Jedi Master with her unique style of fighting, which included the use of two lightsabers. But Vosa was emotionally unstable and subject to aggressive rages. During the Galidraan conflict, she single-handedly killed at least 20 Mandalorians in battle." Vosa has also moved faster than the eye can see, easily deflected blaster fire from every direction simultaneously and rapidly cut down Jabba the Hutt's mercenaries. "The Gamorreans opened fire from either side, but Vosa moved faster than they could shoot, faster even than the naked eye could see. Adapting the Form One style of Soresu, she whirled her lightsabers in front of her, their blades absorbing and deflecting the blasts easily from all sides. The outcome was never truly in doubt. Darting forward, she slashed the blaster directly from the hand of the nearest thug, piston-kicked him backward, and spun to bisect the Trandoshan behind her neatly at the waist. Throughout it all, the expression on her face—focused yet unhurried, almost relaxed—revealed virtually nothing about what was happening inside her mind, nor about the true purpose of her visit here." Jango's Armor allows him to take glancing shots from blaster bolts without issue, as well as tank extremely large falls at high velocities. Jango also has access to "Anti-security blades", which allow him to disrupt and manipulate advanced electronics. Jango's WESTAR-34 blaster pistols are so powerful that had they not been built from an expensive Dallorian alloy, they would melt regular blaster metal. A pair of Wester-34 blaster pistols delivered with a withering rate of fire - enough to beat even a Jedi's reactions. @fetts Did I miss anything? @i_like_swords: Nice Job good sir. @i_like_swords: BTW were did you get these from? @i_like_swords: Interesting. When will the Boba one be up? I am having so much fun with this sale. @i_like_swords: I think I should get some extra comics too... did you get them for Kindle, or what? When will the Theron Shan thread be up, then? @shootingnova: From Dark Horse's digital store/app. Go to digital.darkhorse.com and search Star Wars. Then just sift through everything that pops up. It'll be up in a couple of days. I'm gonna re-read Annihilation tomorrow to get his feats. He got a few good ones in there. INB4 "none of that is canon anymore." @i_like_swords: Question? How were you able to use the pictures from Darkhorse Digital on this thread or how did you transfer these images to your computer? Because I've both a bunch of comics from digital darkhorse, but I can't copy and paste the images to my computer or Vine account. Alright first, just get the full image you want to save on your screen. Make sure you can see all of it. Hold down FN and then press END or "PRTSC". This will "print screen", essentially copying whatever is on your screen at the time of pressing it. Go into Paint and press CTRL+V and it will paste whatever was on your screen when you print screened. Then, use the select tool to drag a rectangle around the page/panel you want in the picture. Right click, crop, and walla! You have the image you want. @fetts: Woah, that's pretty awesome to hear from the Fett-man himself! Thanks. Btw, man, you need to get on Dark Horse's digital store and get as many Star Wars comics (including these Jango Fett stories) as you can now! Everything is literally quartered in price. I got all of Jango and Boba's comics (save for probably 2-3) for like $40 dollars, maybe less. I dunno. I bought like 2000 pages worth of comics for $55 (or £33 if that's your currency). It's crazy! @i_like_swords: O_O Dang son! I'm definitely going to have to check that out. @whirlwind_33: You bet I will. Just bought all of the Dawn of the Jedi stuff! Updated with a bunch of feats from the game Star Wars Bounty Hunter. If you're a fan of Jango Fett, I recommend either playing the game or watching the playthrough on youtube, since the story goes into a lot about Jango's origin and gives some insight into things like where he got the ship Slave I, and how he met Zam Wessel. @obi_wan__: Jango got abit hard done by in his fight against Mace, as he went to retreat his jet pack was damaged meaning he was unable to. Led to his death, would of loved Boba to kill Windu because of this, but alas no luck there. Jango Fett is a boss. That was a great game! Loved how while you were going about your business you could scan the crowd for any outstanding bounties. Funnily enough I don't even own it. I just watched the playthrough on youtube to gather feats. It did look like a blast though, and I enjoyed the story, especially as a Jango Fett fan. Agreed.. although with the new movies coming I can see Boba Fett becoming a bit of an icon in the coming years. One modern fight scene and he'll have action figures, comics, video games.. well, that's what I hope for, anyway. There's also meant to be a Boba Fett solo movie, I hear, so that's definitely something to look forward to. And yeah, I'm upset about that being cancelled too - game looked awesome. Disney canned a lot of great projects when they took over. There was a Darth Maul game in production too, which was also canned. Trebor had slaughtered several waves of droid battalions (which contains roughly 150 droids each) prior to this according to Insider, so he's a highly capable fighter and blaster bolt deflector. Wow, this is new to me. I always heard that Trebor was a sucky Council member, so could you post the Insider quote? And great respect thread. @i_like_swords: Uhm, how do you know that a wave= 150 droids? And he also had help, though as a feat it would still be above average. @zapan87: Well, actually.. according to the Essential Guide to Warfare a droid "battalion" consists of 784 droids. I was mixing the term up with a Clone "company", which consists of around 144 clones. @i_like_swords: 784? Jesus, that would mean that overall he destroyed and deflected blaster fire from thousands of droids. I think it's hyperbole, so it would be more in the hundreds range. @zapan87: As you said, he had help from the other Jedi as well. But given the sheer numbers of the droids he's still pretty dope.